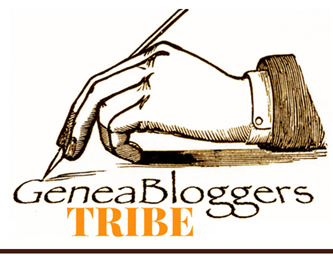 Alona from LoneTester blog has offered us this fun “When I was young” geneameme and it’s been a pleasure reflecting on the answers. Do you (or your parents) have any memorabilia from when you were a baby? (ie. baby book, lock of hair, first shoes etc.) Yes, I am lucky to have a baby book, baby photos, bracelet and other odds and ends. Do you know if you were named after anyone? Quite the opposite – I was named so none of my name included any of my paternal grandmother’s…hence the “een” ending. Ironically Catherine is a name I now know to be threaded through generations of my Irish, German and Scots ancestry. And do you know of any other names your parents might have named you? Paul, because I was supposed to be a boy. What is your earliest memory? Hard to say, I have vague memories of my maternal grandmother who died before I was four and used to bring biscuits when she visited. No specific memory other than that. 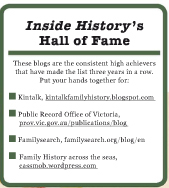 Did your parent/s (or older siblings) read, sing or tell stories to you? Do you remember any of these? Yes both read to me. Mum liked fairy tales and Dad would buy me religious comics when I was sick (odd because Mum was the religious one). Mum used to sing around the house and at night would sing “turaluralura”, an Irish lullaby. When you were young, do you remember what it was that you wanted to grow up to be? I wanted to be a marine biologist until 2nd year uni…just as well it didn’t work out as I get claustrophobic with snorkel masks, let alone scuba diving gear. Did you have a favourite teacher at school? Sr Gemma in Grade 8 and Sr Mary Benedict for Years 11-12. Both made an enormous difference to my eduction. How did you get to school? Primary School: Walking – it wasn’t far and we didn’t own a car. Secondary school: bus to Fortitude Valley. University: Bus and tram. What games did playtime involve? Skipping, tiggy, elastics….??? At home, dolls and dress-ups or guns and cowboys. Did you have a cubby house? Not a fancy one, but a special play space under the house (remember Qld houses are on stilts), and I’d sometimes build one with old sheets etc under the steps etc. 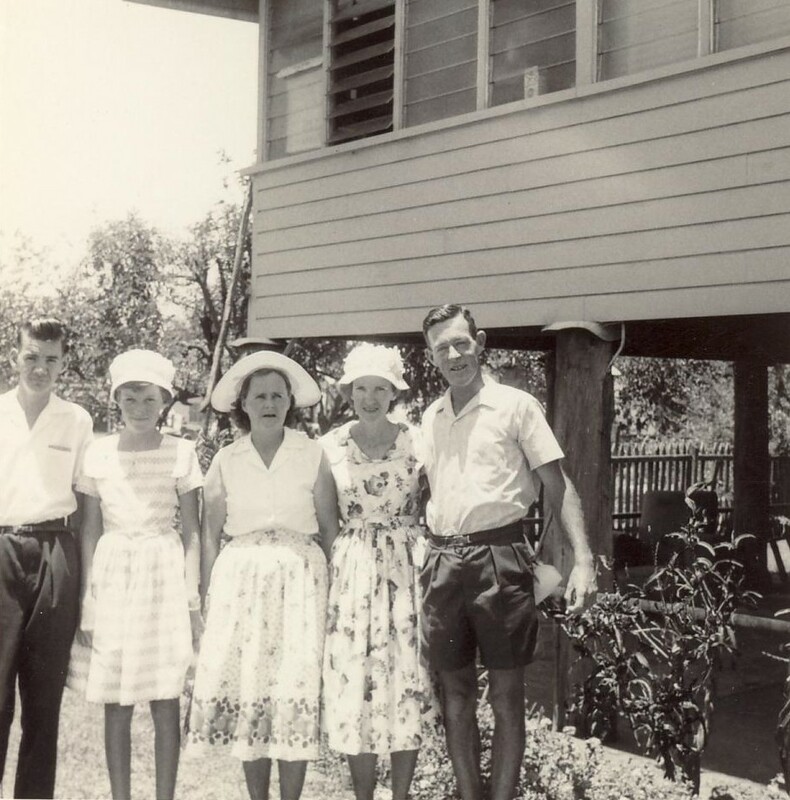 Cousin Jimmy, me Aunty Mary, Mum and Dad in Cairns. What was something you remember from an early family holiday? The 2.5 day train ride on the Sunlander from Brisbane to Townsville for holidays on Magnetic Island. Throwing newspapers to the railway gangers in their tents by the line. Buying fish, chips and (potato) scallops in Rockhampton. Meeting up with Mum’s childhood friend and her family, and a couple of aunts. What is a memory from one of your childhood birthdays or Christmas? The smell of the small gum tree that dad would cut from down the creek bank. 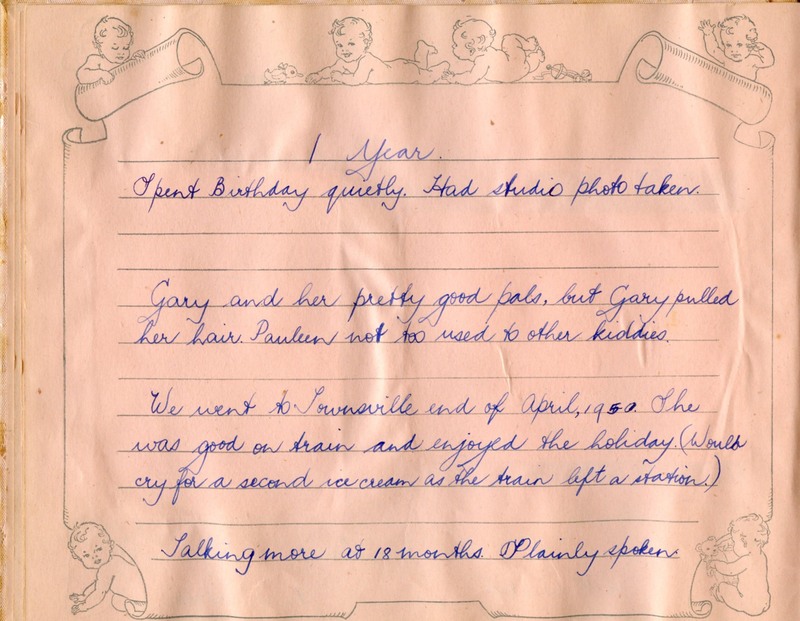 I remember that my friends were often away for my birthday as it was school holidays…poor me, boo hoo. 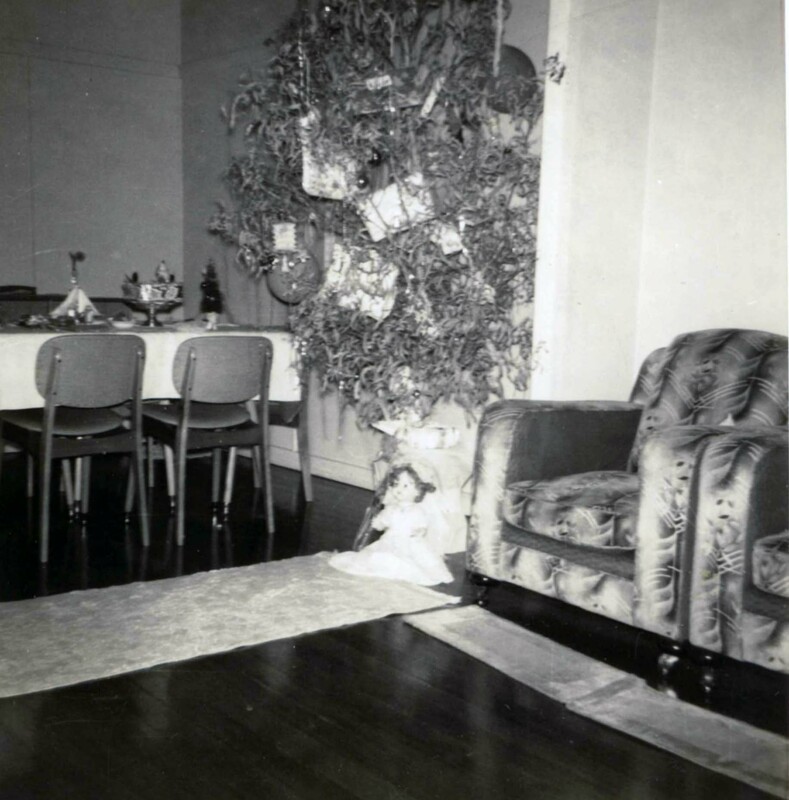 Our gum tree Christmas tree when I was a child. What childhood injuries do you remember? I was lucky to have no broken bones etc (touch wood!) so one stands out….I cut my left calf on a sticky-out bit on a bike pedal. The family friend in the next street carried me home with it bleeding everywhere then we went to the hospital – strangely I don’t remember how, given we didn’t have a car. I still have the faded scar as a memento. What was your first pet? Cats, cats and more cats. 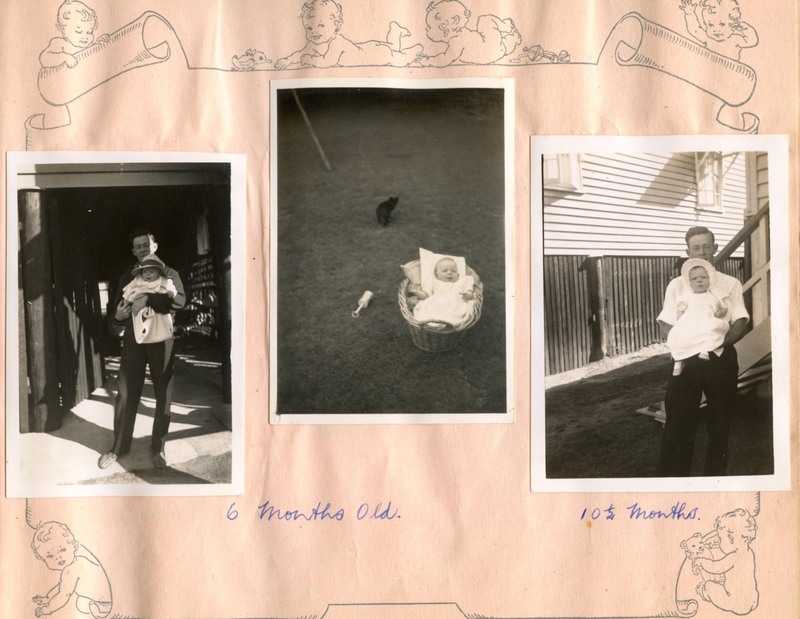 Did your grandparents, or older relatives tell you stories of “when I was young ..?” Not really. My paternal grandparents lived next door but they didn’t tell those sorts of stories. Instead my grandmother introduced me to Scottish music, bagpipes and dancing. What was entertainment when you were young? The radio I guess, though I don’t remember listening to it a lot until I was a teenager. 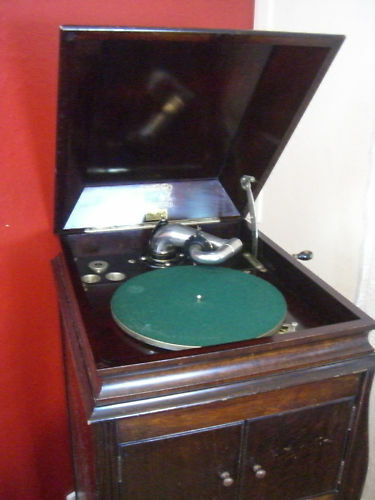 My grandmother had a gramophone which I’ve inherited (currently being minded by my friend in Brisbane) and I loved checking the needle, winding it up, and playing those heavy old records. Sometimes if you visited a home where they had a piano there might be singalongs but my family didn’t do this much, perhaps because of Dad’s shift work. Otherwise entertainment was books, hence my addiction, one I shared with Dad. Sometimes we’d go to the neighbourhood picture theatre for the movies. I remember seeing Fantasia in the city with Mum and Aunty Emily and being scared silly by all those marauding brooms. Do you remember what it was it like when your family got a new fangled invention? (ie. telephone, TV, VCR, microwave, computer?) Heck, I even remember when we first got some colour camera film when a “rich” relation brought some back from the USA for us. Until we got a telephone when I was in my mid-late teens I used to have to sit nearby while Mum rang her friend from a public phone box…man they could talk! We bought a Commodore computer for our own family in the late 1980s and a VCR in the mid-1980s. 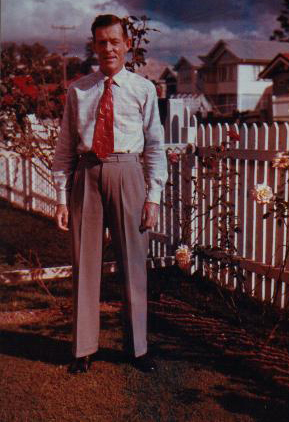 One of our first colour photos – Dad among his roses. Did your family have a TV? Was it b&w or colour? And how many channels did you get? I remember the neighbours down the next street getting a black and white TV – maybe because they had several children? We got a B&W one when I was in my teens – probably a good thing because we didn’t have any in PNG after we were married. Channels – no idea.Two or three I think. Did your family move house when you were young? Do you remember it? No, I lived in the same house until I married and Dad lived on the same block his whole life. 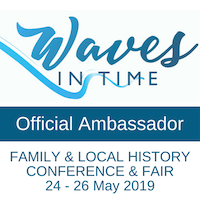 Was your family involved in any natural disasters happening during your childhood (ie.fire, flood, cyclone, earthquake etc) I remember an early trip to Magnetic Island when there was a cyclone and the palm trees seemed to touch their toes. Despite this Dad took me up the back to go to the toilet….probably I was scared….it’s a wonder he didn’t say to use a bucket! We got taken off the island by army duck then a couple of days later we took the ferry to Green Island and as Mum always says “were green on the way over, and green on the way back”. I still remember the boat dipping from side to side, just touching the water. 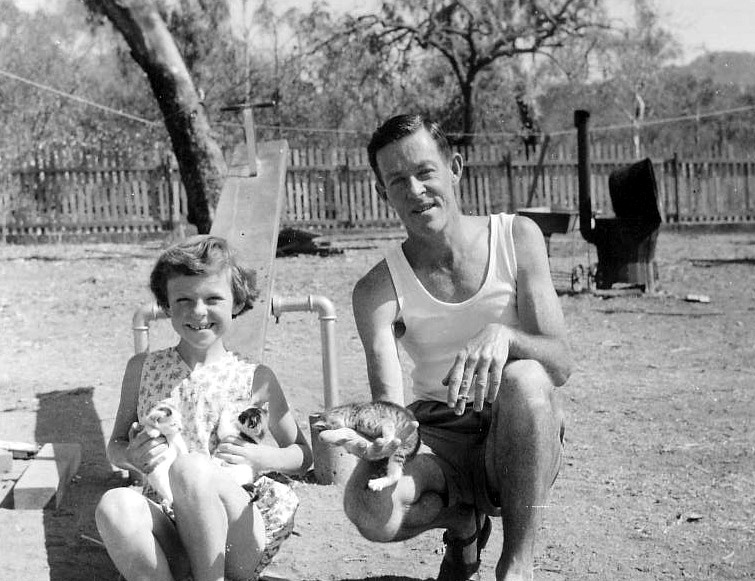 Dad was one of the few who didn’t get sick, but put him on a mill-pond and he’d be violently ill.
One of my favourite photos – Dad, me and the kittens at the holiday flat at Picnic Bay, Magnetic Island, where we stayed during the cyclone. Is there any particular music that when you hear it, sparks a childhood memory? Tura lura lura, Bing Crosby, Oh Tannenbaum, certain hymns. My daughter still sings turalura to her children. I wonder who Mum learnt it from – perhaps her Irish father. What is something that an older family member taught you to do? Mum taught me to sew, and must have taught me some crocheting too I think.Dad’s mother had been a dressmaker but as she was already in her late 70s when I was a child, she never bothered sewing any more, though I did enjoy playing with the buttons she had in a jar. What are brands that you remember from when you were a kid? TAA, Ansett (thanks Alona! ), Waltons, McWhirter, TC Beirne’s, those heart-shaped lollies with writing on them (and yes, fags lollies), Persil washing powder, Reckitt’s blue bags, Lux flakes. I’m sure there are many I’ve forgotten. 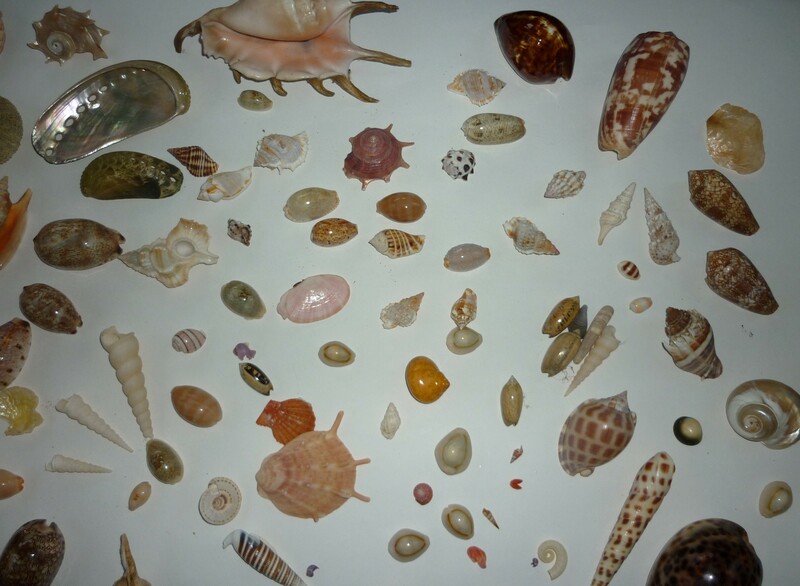 Some of the lovely shells I still have in my collection. Did you used to collect anything? (ie. rocks, shells, stickers … etc.) Shells and books. (see above) Now I feel very guilty about the environmental impact of shell collecting. Like Dad I still have a partiality for collecting the odd stone that takes my fancy. 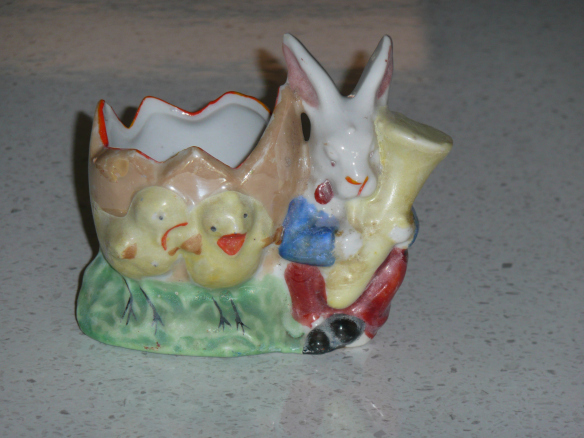 An Easter gift from Aunty Emily. this is a tough one. We’d sometimes go to a highpoint nearby and admire the city lights or the stars….one of Mum’s much-loved things to do. Or, at Easter, getting to eat all the lollies one had given up for Lent but kept stored in a jar….time for a pig-out. Getting special treats like tiny cups and saucers from my maternal great-aunt. Visiting New Farm Park with her and Mum and seeing the beautiful roses there. Helping Mum with the cake and biscuit baking on Saturdays….and licking the bowl. School fetes etc etc. Sport: I was pretty rubbish at sport though I enjoyed informal sprints down the streets with the neighbourhood kids. I also learned to play tennis which I can’t say that I loved…or was very good at. Ditto swimming classes and swimming club at the Valley Pool….ugh. Music: I learned to play the piano for a while with the nuns at my primary school. I remember playing chopsticks or Elvis Presley’s Wooden Heart on our neighbour’s piano with my friend. We would race to complete it in the shortest time possible -it’s a wonder her parents didn’t throw us out. Games: Who remembers this game…it seems to be having a resurgence as we saw some in Sydney. http://youtu.be/X1DArckNWdM And then there was the introduction of hula hoops and yo-yos. And what about board games like snakes and ladders or Chinese chequers? .Thanks Alona for this trip down memory lane. And thanks Mum for all the photos I have and my own love of photography.